No need to introduce Arion Roşu (1924-2007), eminent scholar in the study of Ayurveda. Roşu was drawn to the subject of traditional Indian medicine from the 1950s. His doctoral thesis, supervised by Jean Filliozat, was published under the title Les conceptions psychologiques dans les textes médicaux indiens (Publications de l’Institut de civilisation indienne, 1978). Roşu explored the themes of longevity, immortality and rejuvenation - the focus of the AyurYog project - early on, notably in “Considérations sur une technique du rasāyana āyurvédique” (Indo-Iranian Journal, 17, 1-2: 1–29 and 3-4:395 [erratum] 1975). It is less well-known that Arion Roşu was also a pioneer in the study of Sanskrit alchemical texts. In his obituary for Arion Roşu (“In Memoriam Arion Roşu”, Studia Asiatica 9,10: 19), Eugen Ciurtin points to Roşu's work on the alchemical treatise Rasendracūḍāmaṇi. Roşu edited, translated and annotated a difficult fragment of this work, which to date, however, remains unpublished. Roşu's study, “Marcelin Berthelot et l’alchimie indienne,” which marks his dedication to the history of Oriental Studies, should also be mentioned in regard to his work on Indian alchemy. Arion Roşu’s curiosity and talent let him step across disciplines and centuries to disentangle the first tangled threads of the common history of yoga, ayurveda and alchemy. Already in the position paper of his thesis, published in the “Préambule” to the essays gathered in his honour (see below), he brought together the figures of the physician and the yogin: “Paleomedical Sanskrit thought has equally close relationships with the pan-Indian disciplines of control of the mind and body taught by yoga, traditionally associated with the school of Sāṃkhya. Indeed, both the yogin and the vaidya consider man (puruṣa) in view of the correlations between the physical and the psychic” (quoted by Colette Caillat, “En guise d’introduction,” p.13). His thesis also devotes a few pages to ”yogatherapy” (p. 39-41). A further example is his article “Les marman et les arts martiaux indiens” (Journal asiatique 269, 417–451, 1981), which provides valuable comparisons between the conceptions of vital points in yoga and ayurveda. Regarding the common ground of yogic and alchemical speculations, his paper “Yoga et alchimie” (1982) is a landmark. It precedes the inescapable Alchemical Body (1996) of David G. White, in this “canton” – in the words of Roşu – of Indian studies. In this essay, Arion Roşu examined the shared representations of the body in the context of rasāyana therapy as well as alchemy (rasaśāstra, rasavidyā) and yoga soteriology. He wrote: “The techniques for a long life are intimately associated with the quest for liberation in this life (jīvanmukti). The conception of an incorruptible, divine body (divyadeha), which contains this infinitely precious treasure that is the ātman, nourishes in various ways not only tantrism and alchemy, but also medicine and yoga” (p. 366-367). ● To search the complete list of offprints: On the page of the Catalogue of the Library of Indian Studies of the Collège de France, go to the tab “Recherche alphabétique” (3rd tab). In the box “Sélectionnez un index à parcourir,” select “Cote” and in the box “Saisissez un mot ou une expression,” type “TP.Rosu” (adhering to upper and lower case), then click “OK”: The complete list of offprints belonging to Arion Roşu appears, with the titles classified by index number. ● To search the list of monographs according to thematic shelf numbers: On the page of the Catalogue of the Library of Indian Studies of the Collège de France, go under the tab “Recherche alphabétique” (3rd tab). In the box “Sélectionnez un index à parcourir,” select “Cote” and in the box “Saisissez un mot ou une expression,” type “OPUSC.Rosu” or “MED.I” (the shelf number is here sub-divided with Roman numerals I, II, III, etc. ), or “HIST.SC.” (again adhering to upper and lower case), then click “OK”. The latter two shelf numbers refer to books dealing with medicine and the history of science. 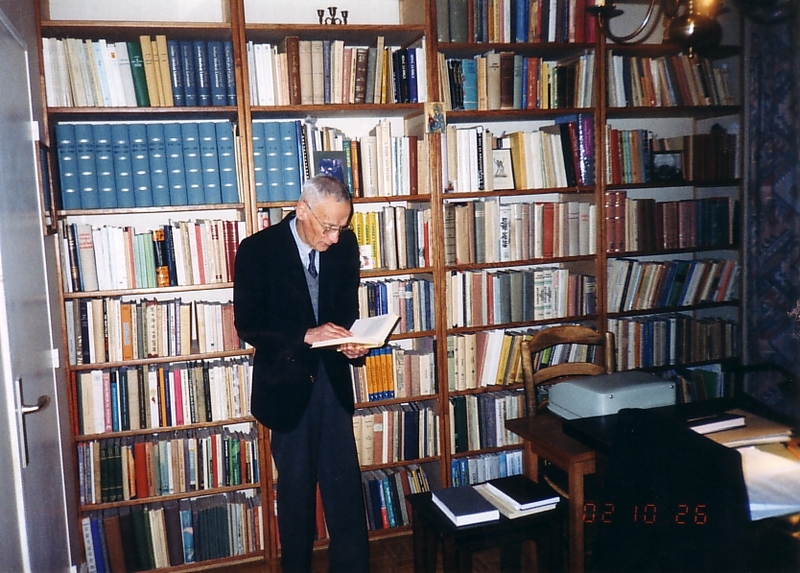 Other books from Arion Roşu’s library can also be found under the following shelf numbers: “MED.Tex” for texts on medicine, “MED.Et” for studies on medicine, “SC.TECH” for science and technology, “SC. ASTR” for astronomy and astrology, “SC.NAT” for natural sciences, “BOTA” for the botany, “YOGA” for yoga, and “TANT” for tantrism. This search also lets you visit the Indian studies collection at the Collège de France according to thematic topics. ● But it is also possible to consult the entire collection of monographs left by Arion Roşu, regardless of the shelf number: On the page of the Catalogue of the Library of Indian Studies of the Collège de France, go to the tab “Recherche avancée” (2nd tab). There, in the first box “Champs”, select “Numéro d’inventaire” and then type the command: “I-AR. *” (do not forget the asterisk!). Then click “OK”. Under “Résultats” the number 650 is the number of books listed under the inventory reference “Arion Roşu”. By clicking on this number, the list appears, books being classified by year of publication, author or title, and not according to topic or discipline. ● For the sake of completeness, one should also consult the list of 212 monographs transferred from Paris to Bucharest in 2012. These are mostly editions of Sanskrit texts and reference books on Indology from Roşu’s collection that the Library of Indian studies of the College of France already owned. The Archaevs Editorial Board published this list: “New acquisitions of the Library of the Institute for the History of Religions (2012): Indological Library of the Late Arion Roşu” (Archaeus. Studies in the History of Religions XVI 1-4 / 2012 p. 269-280, www.ceeol.com). A listing of these volumes and of the other unpublished materials, now housed in the Department of Indian Religions of the Institute for the History of Religions in Bucharest, will be available online soon. Arion Roşu left his private collection to the Collège de France under the provision that all the works were accepted without exception. Thus, the lists of monographs and of offprints offer a fairly complete impression of Roşu's wide range of scholarly interests and reveal his intense fascination with Asian cultures. My heartfelt thanks to Ronan Moreau, lecturer (Collège de France), in charge of the Library of the Institute of Indian Studies, who provided me with all the information, answered all my questions and allowed me to access the Arion Roşu collection. Many thanks also to Eugen Ciurtin (Institute for the History of Religions, Academia Romana) for his helpful comments and for making the above picture of Arion Roşu available.